WHILE Lewis Hamilton is enjoying his resurgence in the Formula One title race, Mercedes teammate Valtteri Bottas heads into the summer break feeling a little let down. Bottas has insisted this season - and last - that he is on an equal footing with Hamilton and disputed talk he is effectively the team's No. 2 driver. But following Sunday's Hungarian Grand Prix, the 28-year-old Bottas was described by the team's head of motorsport Toto Wolff as a "sensational wingman" - after helping to defend Hamilton's leading position as the Ferraris of Sebastian Vettel and Kimi Raikkonen pressured behind Bottas. Hamilton won the race, while Bottas slipped from second to fifth late on after clipping the back of Vettel's car and then bumping sides with the Red Bull of Daniel Ricciardo. Bottas was adjudged to have been at fault for the Ricciardo incident and handed a 10-second time penalty. The Aussie then gave Bottas a one-finger salute when he passed him. Wolff was speaking to television reporters after the race when he said Bottas "deserved a podium because he was such a sensational wingman". Those comments did not go down well with Bottas, who joined Mercedes last year after several seasons with the Williams team. "First of all, 'wingman' hurts," Bottas also told TV reporters. "I don't see any positives in this race for me. I wanted a better result." Last weekend, Bottas was ordered over team radio to "hold position" - in other words not to attack Hamilton - late in the German Grand Prix. Moments before that team call, Bottas nearly overtook Hamilton as they resumed racing following a safety car being deployed on the wet track after Vettel had crashed. Hamilton won in Germany to reclaim the title lead from Vettel, and he is now 24 points clear of the German driver at the top. Bottas has already been asked several times if he is essentially a support driver, or ideal teammate, to Hamilton. 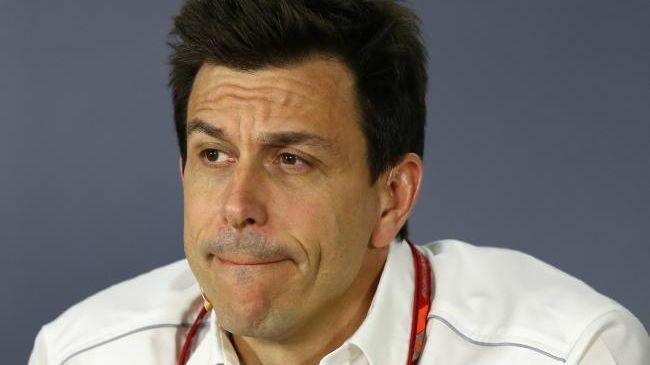 Both Bottas and Wolff have insisted he is free to compete on equal terms. After Saturday's qualifying session, Bottas said "we are free to fight, so I'm looking forward to (the race)". But he clearly seemed irked at being described as a wingman and said he would seek clarification. "I think we need to speak after this race," Bottas said. "For sure the team will decide at some point." Wolff clarified his comments after the race, saying he didn't mean to disrespect Bottas in any way. "In today's race, starting P2, after lap one, Valtteri's race was the perfect wingman race - and I don't mean it in championship terms, because we have no No. 1, we have no number two, but it was just how he was racing. "We were surprised he managed to hold Sebastian and Kimi behind for 25 or so laps and we knew the last five laps would be really critical. "The bittersweet feeling I have is that he would have deserved to finish P2 - where he has started and where he was after lap one. "But, are you saying maybe the word wingman doesn't do him justice? He just drove a sensational race and helped Lewis, in a way, to build the lead." Then, after he'd cooled down, Bottas backtracked on his earlier remarks, saying on social media he in fact wouldn't seek a meeting with his boss over being labelled a "wingman". "I have not called a meeting with the bosses for Toto saying I was the perfect wingman in this race," Bottas's statement said. "There is no need to. I was disappointed with my end-result in the race and saw everything in a negative way for a moment. "We are on equal terms and I trust the team 100 per cent on that. All good. We'll keep pushing! It'll come." Bottas won three races for Mercedes in 2017 but has yet to win one so far this season. He is fourth overall in the standings and trails third-place Kimi Raikkonen by 14 points. Bottas was recently handed a new one-year contract. Although he has the option for an extra year in 2020, the perception is the Finnish driver will have to earn it with strong performances in 2019. "I'm looking forward to the next weeks," Bottas said about the summer break. "I want to come back stronger." He will get the chance to challenge Hamilton at the Belgian GP on Aug. 26.